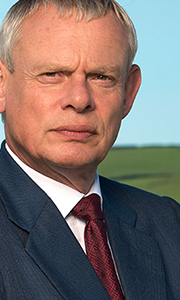 Martin Clunes returns for a one-off special of the award winning comedy drama Doc Martin. All is not well in Portwenn, home of Doctor Martin Ellingham (Clunes), as the peaceful life in the village has been shattered by an invasion of tourists, eager for a sighting of a rare bird, which was discovered nesting on Aunt Joan's land. Aunt Joan wants to keep the bird a secret to protect it from prospective egg thieves. But Bert Large lets sli..
Doc Martin; Series One Stars Martin Clunes (Men Behaving Badly, William and Mary, Goodbye, Mr Chips) as Doctor Martin Ellingham, a celebrated London surgeon who turns his back on city life and moves to a sleepy Cornish village to become the local doctor. Despite his surgical brilliance, Doc Martin has no interpersonal skills and his bedside manner soon starts to upset his new patients, causing havoc throughout the village! As the commun..
Own Doc Martin Series 1 to 5 DVD from Deff, DVD, Blu-Ray & 4K Video Specialists - Free UK Delivery..
Own Doc Martin Series 1 to 8 Complete Collection DVD from Deff, DVD, Blu-Ray & 4K Video Specialists - Free UK Delivery..
"Martin Clunes is back as the curmudgeonly Dr. Martin Ellingham, whose truculent and tactless manner causes mayhem in the small Cornish community of Portwenn. Series 2 follows the surly doctor as he continues to negotiate his way around village life. Back to help, and sometimes hinder, are Aunt Joan, Bert and Al Large, the local plumbers, local bobby PC Mark Mylow and school teacher Louisa Glasson, who's no clearer about her feelings fo..
Martin Clunes returns to the role of Dr Martin Ellingham, the grumpy GP whose truculent and tactless, manner upsets the convivial community of Portwenn. The series follow the accidents, emergencies and comedy mishaps in the community while the good doctor continues to bumble through life in the village all the while trying to pursue his ill fated burgeoning romance with headmistress Louisa Glasson (Caroline Catz). But could a breakthrou..
Set against the stunning backdrop of Cornwall and the picture postcard village of Portwenn, Clunes reprises his role of the curmudgeonly Doctor Martin Ellingham whose truculent and tactless manner upsets just about everyone. When we last saw him he had packed his bags ready to take a consultant's position in London. That was until estranged girlfriend Louisa gave birth to their son - who still dosen't have a name... Can the Doc cope wit..
Own Doc Martin Series 1 To 4 DVD from Deff, DVD, Blu-Ray & 4K Video Specialists - Free UK Delivery..
He’s rigid, surly, tactless and self-centred - but he’s the only doctor in Portwenn. Even on his own wedding day, Dr. Martin Ellingham cant raise a smile; but following a suitably disaster-filled honeymoon, he and Louisa must learn to live together, raise a child and manage both their careers as best they can. It’s a big adjustment for them especially Martin, unaccustomed as he is to clutter and noise, but even he's not as picky as thei..
Own Doc Martin Series 7 DVD from Deff, DVD, Blu-Ray & 4K Video Specialists - Free UK Delivery..
Own Doc Martin Series 8 DVD from Deff, DVD, Blu-Ray & 4K Video Specialists - Free UK Delivery..